Over the last few years, Americans have been presented with a buffet of alternative proteins and meals. The rise of fake meats like the Impossible Burger; Soylent, or Muscle Milk for people who code; and the most au naturale, high-protein bugs. Though they’re already part of diets around the world, Americans don’t really eat bugs. Growing environmental concerns about livestock and sustainability, however, have caused some to ask if our future will involve a lot more, say, beans and grubs. Some companies have been pragmatic, recognizing that Americans might be more inclined to bake with, say, cricket flour than grow grubs in a shoebox. One company looking to corner that market is Seek, which today launches its line of cricket-fortified baking flours via a Kickstarter. 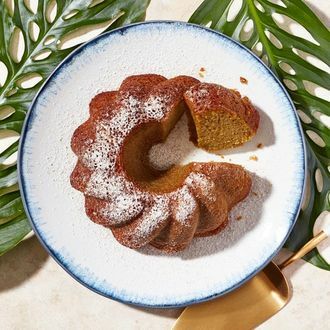 Founded by Robyn Shapiro (a former marketing executive with Ralph Lauren), Seek has created all-purpose, gluten-free, and Paleo blended flours, all of which it says can be used cup for cup in any recipe using flour. (It’s also made a pure cricket powder for smoothies, ice creams, and other liquid-based foods.) The company, which has sold cinnamon-almond crunch cricket protein and snack bites, isn’t the first to peddle ground-up crickets. Two others are Chapul, which since 2011 has produced both cricket protein bars and powders, and Exo, which makes dairy- and gluten-free cricket protein bars in flavors like cocoa nut and banana bread. What’s unique is Seek’s chef-focused approach. The emphasis on pedigreed recipes from talented chefs also feels like a shift away from the marketing of some cricket companies, which try to snag Paleo bros with promises of more protein and no dairy. As part of its launch, Seek has collaborated on recipes with chefs (with heavy representation from New York) on The Cricket Cookbook. It’s a refreshing cast that isn’t just the usual names, and includes La Newyorkina’s Fany Gerson, a Mexico City native who has sold cricket sundaes; the Sioux chef and cookbook author Sean Sherman, who has devoted himself to revitalizing the indigenous kitchen; and Malcolm Livingston, the former Noma pastry chef and member of Bronx food crew Ghetto Gastro; and more. It’s an interesting, and frankly smart, way to try to sell this product. Doubly so because Shapiro has recruited chefs for whom eating bugs is already a part of their cuisine (like Gerson and Mexico City’s Elena Reygadas) or for whom insects have been a culinary calling (Bun Lai of New Haven’s Miya’s Sushi). There are also some skilled bakers who, if you’re tepid about bringing bugs into your kitchen, will give you more confidence, like Café Altro Paradiso and Flora Bar pastry chef Natasha Pickowicz. People are biting: It has already raised nearly $13,000 from 28 backers (as of publication,) so it’ll almost certainly hit its $25,000 goal. The flours will initially only be available via the Kickstarter; if all goes according to plan, Seek will sell them nationwide starting in the fall. The cookbook, too, will eventually go on sale on Seek’s website, but only after the Kickstarter campaign. Backers will get a discount and a chance for a signed copy.